It’s The Legal Genealogist‘s mantra — the phrase repeated time and again, over and over. To understand the records, we have to understand the law — and not just the law in general, but the law of the time and the place. That’s because, so very often, it’s the law that provides the reason why our ancestors did what they did when they did it and where they did it. You can see this, just as one example, in the book of early statutes of Arizona — the book I was poking around in last night as I prepare for this weekend’s Annual Meeting and Seminar of the Family History Society of Arizona. So… can’t find a divorce that you think should exist? So… still can’t find a divorce that you think should exist? Now those laws changed — and changed rapidly. 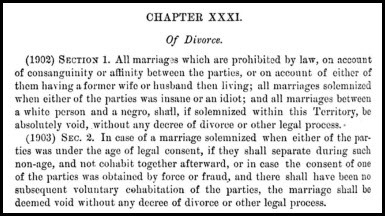 By 1865, the residency requirement had dropped from a year to six months,6 and court action was generally required to end any marriage. The grounds for divorce continued to change and expand as well. So don’t be surprised to find that something that wasn’t required or allowed in one year was required or allowed in the next. Bottom line: in this vital area of human activity, it’s often going to be the law that provides the reason why our ancestors did what they did when they did it and where they did it. And if you’re around in Arizona this weekend — for a Friday night session at the Granite Reef Senior Center in Scottsdale and/or the Saturday sessions at the Central United Methodist Church in Phoenix — come on out and join me and the Family History Society of Arizona. We’ll be talking about this very topic of the law and our research, and about indirect evidence, using court records, our elusive female ancestors and tax lists as genealogical resources. Online registration is closed, but walk-ins are welcome, so you can still register at the door.